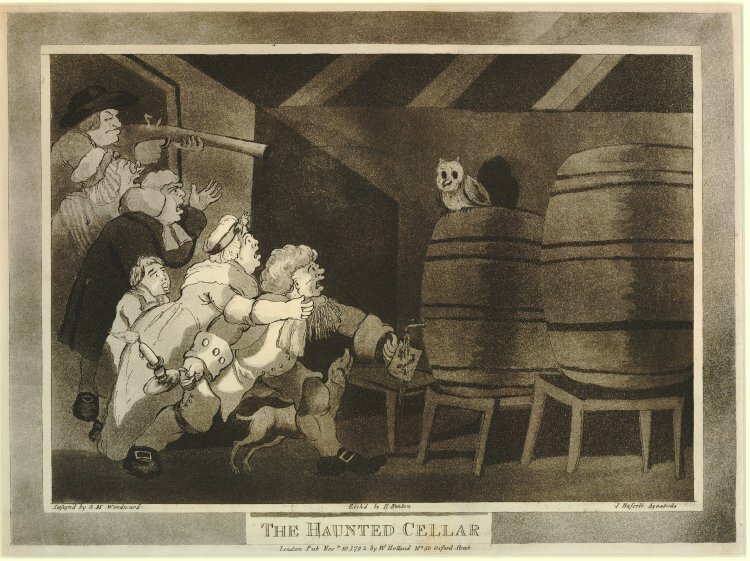 Hauntings and other spooky goings-on were to become a recurring theme in English caricature from the 1790s onward. It was a trend that undoubtedly reflected the growing popularity of gothic novels rich in ghosts, goblins and funny little men living in ruined castles, as well as the first rumblings of an animist movement that would eventually flourish into the spiritualist craze of the Victorian-era. 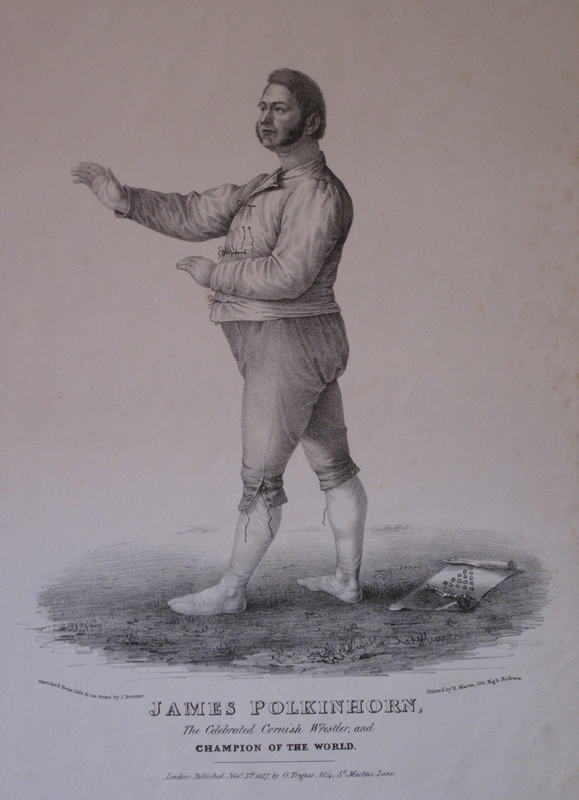 Some of these ghost prints were simply humorous images designed to raise a laugh at the expense of the stock figure of the incredulous yokel, while ghosts often played a more dramatically Shakespearean role when used in political satires. Thus has his Majesty’s revenue there been happily relieved from the fraudful interference of a supernatural agency. Ghosts will now be suspected of smuggling, and customs house officers may lay violent hands on the spectre of the night without fear of premature perdition. John McGahey, A Scene in Liverpool, Bold Street Mid-day, c.1840, Bold Street was one of Liverpool’s main commercial thoroughfares and home to at least six printsellers during the early part of the nineteenth-century. 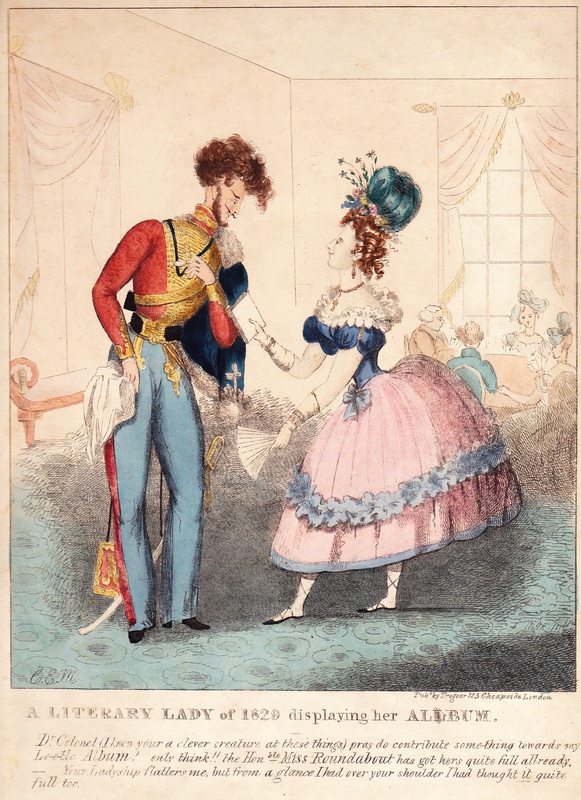 Those of you with good memories may recall a couple of articles which appeared on the blog last year, in which I shared some thoughts on the state of the provincial trade in satirical prints in Britain during the late eighteenth and early nineteenth-century. Those of you who don’t remember can catch up by clicking here (1, 2), and should probably try to eat more oily fish in future. Using a combination of source materials and a basic geo-mapping tool, I was able to create a series of maps showing the number and geographic distribution of printsellers operating outside London in 1784, 1819 and 1832. These maps, when paired with data from the British Book Trade Index showing a rise in the number of businesses dealing solely in prints, seemed to be indicative of a trade in printed images which was growing larger and more complex over the fifty year period under consideration. While it was relatively easy to prove that the number of printshops in England had increased during the early nineteenth-century, it was far more difficult to determine how satirical prints fit into a commercial landscape which was obviously becoming larger and more diverse. I was essentially relying on the publication lines of the prints in the British Museum to provide me with evidence of caricatures being produced in the provinces, and unfortunately the Museum’s collection contains hardly any items which were published outside London before the mid-1820s. I was therefore left to conclude that the provincial market for satirical prints during the so-called “golden age of British caricature” probably consisted of a small, wealthy elite, who passively consumed caricatures and other luxuries imported from the metropolis. Caricatures had not been published in the provinces because such items would have lacked the cultural cachet of metropolitan satires which reflect the worlds of national politics and high society. Looking back on all of this now, I realise that I missed a trick by failing to include an analysis of newspaper advertisements in my original research. 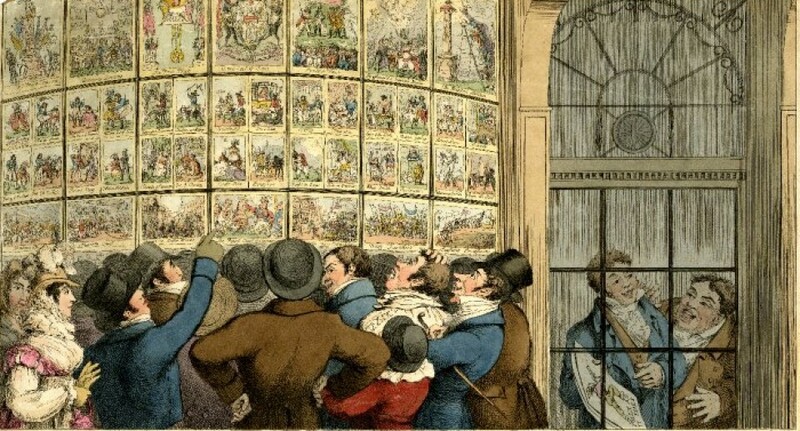 Analysing the publication lines of prints themselves was never likely to reveal much about the domestic trade in satires, as the vast majority of satirical prints were being published in London and a proper understanding of the provincial print trade must therefore inevitably focus on the marketing and distribution networks which allowed prints to flow out from the capital and into the regions. Having recently acquired temporary access to the British Newspaper Archive’s online portal, I decided to scan provincial newspapers published between 1783 and 1815 for information relating to satirical prints, caricaturists and printsellers. 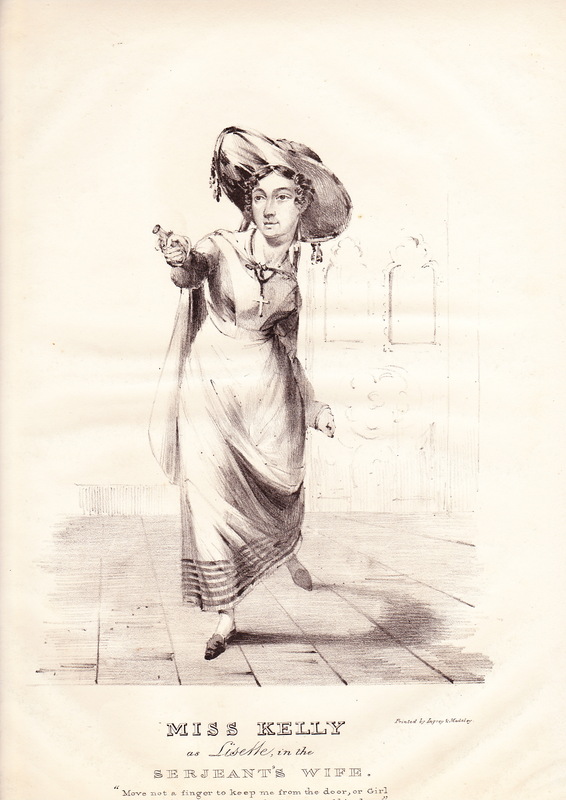 Exhibition and sale of capital prints and drawings, humorous and political caricatures &c. at the Society’s room for encouraging painting and design… Tickets to be had at Mr Green’s silversmith, or Mr Pye’s music shop and Mr Fletcher’s stationer. Hours of admittance between ten and four . The singling out of “humorous and political caricatures” gives us some indication of their particular popularity at the time. An article from the Chester Chronicle, criticising printsellers in Manchester for displaying unpatriotic caricatures which might discourage young men from joining the army, also provides us with definitive proof that satirical prints were displayed in printshop windows around the country . J.V.Z is just returned from Italy and London, wher[e] he has purchased a very large and capital collection ancient and modern paintings, prints and drawings of Italian, French, Dutch and English schools – Transparencies, caricatures, medallions, drawing books, and new invented impressions on satin, velvet & c., for furniture, fire-screens, pictures and the use of schools, which they will dispose of at very low prices. 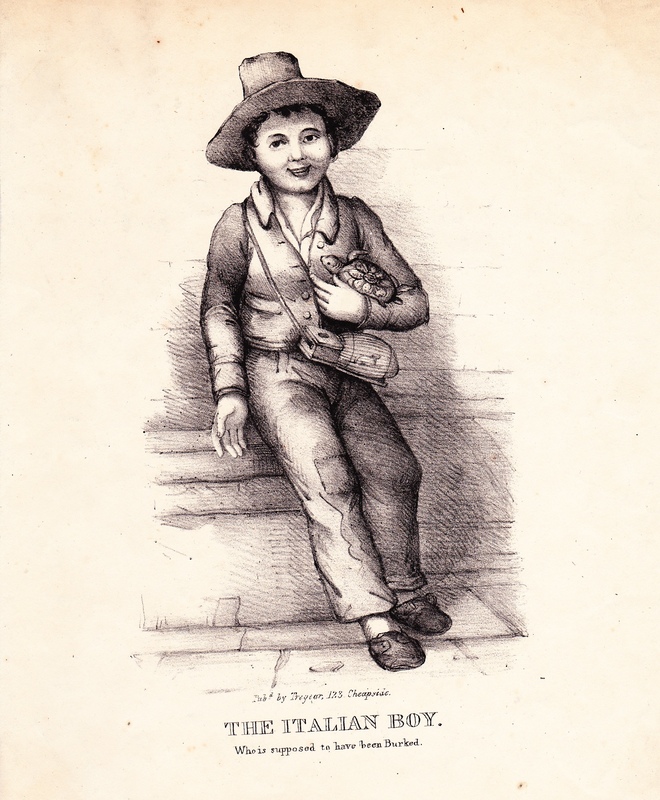 Zanetti was also clearly sensitive to the notion that his fellow Mancunians should be deprived of any service which was available in London and continues by sketching out a proposal to open a reading room above his shop, allowing customers to peruse or borrow folios of caricatures and other prints. JVZ & Co. judging that the want of such an institution as the following, in this town must have long felt by a liberal public, intend fitting up an elegant Subscription Room, at No. 10 Market-street-lane, (to be opened every day from 10 o’clock in the morning to 8 in the evening) where they mean to deposit, for the use and instruction of the subscribers, and to be out to them occasionally, a large and valuable collection of the carious articles above mentioned, with many esteemed books, on the subjects of painting, drawing & c. Terms of Subscription to the room. Each Subscriber for one year, to pay One Guinea – for half year twelve shillings – for a quarter year Seven Shillings. The Room to be opened every day, Sundays excepted, from ten in the morning till eight in the evening. Every Subscriber to be allowed to take out a portfolio of prints & c. which must be returned in one day, on forfeit of 2s 6d… Any person losing or damaging a print, drawing, &c. to make such loss or damage good, or forfeit their Subscription… Admission to the Room for Non-subscribers 1s. Clearly the ability to loan out an album of caricatures for the evening was not limited solely to those who frequented the fashionable printshops of London’s West End. Finally, printsellers would also have acquired new stock in response to consumer demand. This demand appears to have been deliberately cultivated by London-based publishers frequently placing advertisements for new works in both the national and local press. These adverts usually concluded with the tagline ‘available from all book and printsellers in the Kingdom’, which it seems safe to assume was not literally true, but rather designed to encourage potential customers to place an order for the print in question at their local printshop . Such aggressive marketing tactics are entirely consistent with the cutthroat nature of the London publishing trade in this period and it is likely that much of the power in these relationships rested with the buyer. Timothy Clayton’s excellent work on the international trade in caricatures indicates that publishers were often willing to offer generous credit and discount wholesale orders aggressively in order to break into new markets and ward off the competition . On Thursday last was published, Price 6d. Hints of Subjects for Engravings, adapted to the above Plans, whether from Ins or Outs, Whigs or Tories, Person of Distinction, or Persons without Distinction, will be thankfully received and dully attended to . A new and popular work for the Christmas Holidays, embellished with Eight Droll Caricature Prints. This Day is published No. 1, price 8d. or on fine paper with Proof impressions of the Plates 1s… The SOCIAL MAGAZINE, or Cabinet of Wit and Fun!! Containing a rich Fund of amusing Bon Mots, Funny Jests and Witticisms, choice Epigrams, Repartees, &c. intended to excite Mirth and a jovial Laugh to every British subject, at a small expence, by his own Fire-side. Fun! Fun!! Fun!! !… The only magazine wholly appropriated for entertainment. To be had of every bookseller in the kingdom… embellished with a droll caricature print, No. II price only Eight-pence, or on a fine wove paper One Shilling . By the mid-1800s, popular titles such as The Scourge were claiming a circulation of several thousand copies per edition and evidently had a readership which was scattered throughout the United Kingdom . This popularity presumably reflecting both the growth of the middle class audience for satirical prints and perhaps also a preference among provincial audiences for magazines as a value for money alternative to traditional single sheet caricatures. Examples of advertisements containing the names of specific caricaturists are surprisingly few and far between . 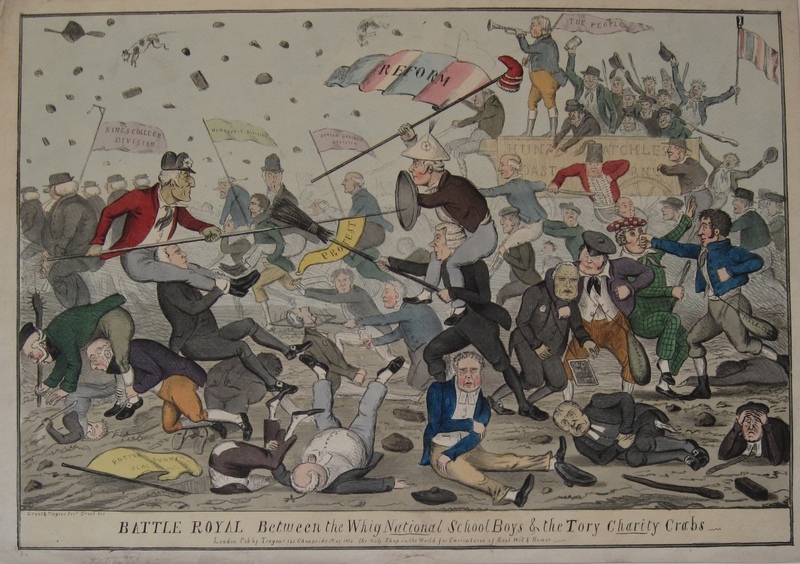 Gillray, Rowlandson and Bunbury all received some level of acknowledgement and therefore must have been known as artistic personalities in their own right, but in most instances the caricaturist was either referred to in euphemistic terms, such as “a celebrated artist”, or was simply not named at all . This process of marginalisation seems to have accelerated during the mid-1800s, when even Rowlandson’s name appears to have been eclipsed in Thomas Tegg’s advertisements for The Caricature Magazine, or Hudibrastic Mirror and A Lecture on Heads, perhaps suggesting the beginnings of a perceived decline in the quality of the genre since its late eighteenth-century heyday . Hopefully, even this superficial sweep of the British Newspaper Archives’ holdings has helped to demonstrate the value of provincial newspapers as a source of information on the trade in caricature prints during the reign of George III. These sources paint a picture of an industry which was developing alongside the wider trade in printed materials and changing to match the country’s shifting economic geography. 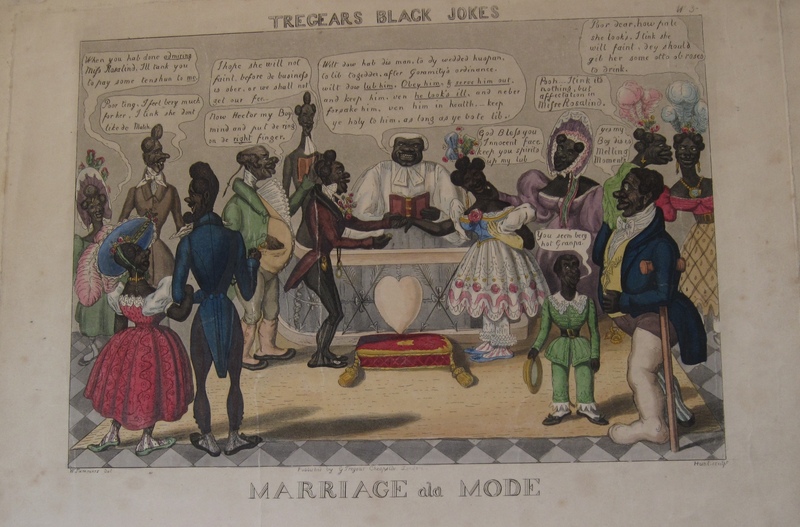 The development of an explicitly national market for satirical prints clearly fits into the wider historical narrative surrounding the stylistic, commercial and technical changes which began to take place in the British print publishing trade after 1800. These were the years in which new formats, such as the caricature magazine began to emerge, and a new wave of printsellers targeting middle class consumers burst into the market. Newspaper sources may also reveal some wider truths about the print-trade in general, particularly with regards to the perceived cultural value of the satirical print and the individuals responsible for producing them. 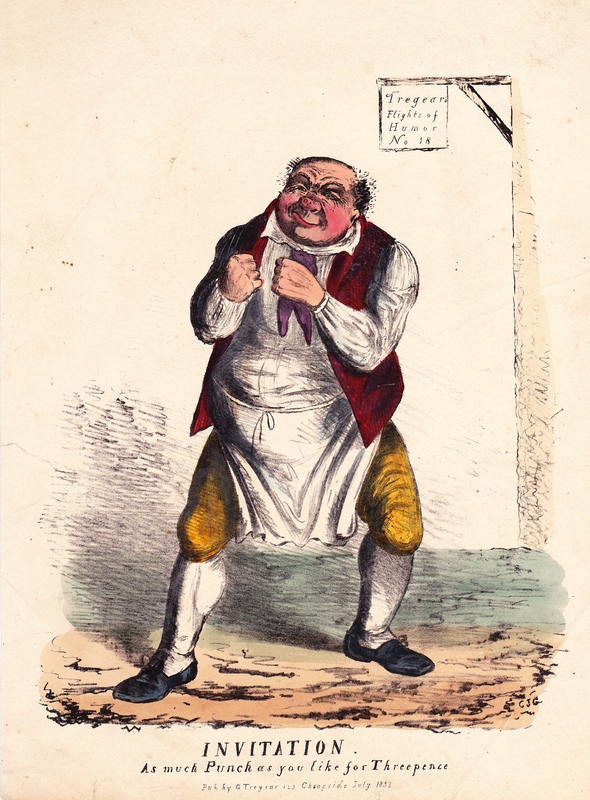 The anonymity in which most caricaturists appear to have worked, coupled with the prolonged harking back a previous generation of satirists, would seem to suggest that the genre’s heyday may have passed several years before historians have typically assumed that the ‘golden age’ of caricature came to an end in Britain. For example, Rowlandson’s The School for Scandal was published by Picot on 1st August 1788 and was advertised in the Derby Mercury on 21st August. The lag between metropolitan and provincial release dates decreased during the early 1790s and by the mid-1800s publishers in London were even providing provincial customers with advanced warning of new publications, see the advertisement for issue no. 1 of The Satirist which appeared in the Chester Chronicle of 11th September 1807. 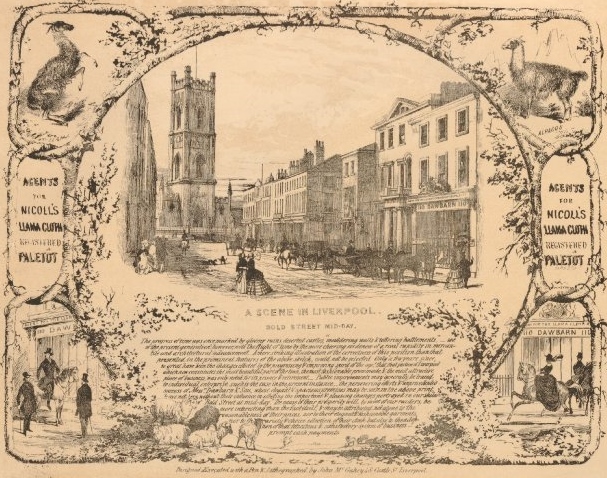 See Martin Hopkinson ‘The Print Market in Liverpool in the Late Eighteenth Century’, Print Quarterly, Vol. 24, No. 2, pp.107 – 108. An advertisement for a print auction published by one Liverpool Newspaper on 17th May 1789 reads: “At the exhibition room over the Library, Lord-street, to be sold by auction on Thursday next, the 21st of May, a large collection of paintings, fine drawings, proofs and other prints in superb burnished gold frames and glasses, an original model of a Roman Emperor in clay, and a model of the Sabines in wax, humorous political caricatures &c.” See the Hull Packet 10th January 1809 for another example of an advertisement in which caricatures are listed among the items offered for sale at an auction of prints. Chester Chronicle 2nd October 1795 – A caricature etching, descriptive of the glorious rewards of war, such as a veteran returning home from the Continent with a wooden leg, surrounded by his starving family, was lately stuck up in the window of a print-shop in Manchester; – the abominable tendency of which drew down the following very benevolent and patriotic rebuke from a gentleman belonging to the order of war-ites: “These things are infamous… they have a shocking effect on the national ardour, and tend to damp the energy of our youths” – How little must this gentlemen know of the energy of British bosoms, to suppose they can be damped by so trifling and simple a thing as a wooden-leg? This may be a reference to James Gillray’s John Bulls Progress, which had been published in 1793 and shows a yeoman marching away from his family and fireside full of martial vigour and returning home a cripple to find his family has been reduced to starvation and penury in his absence. 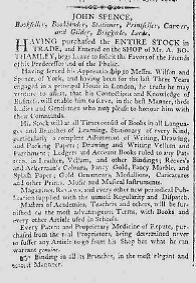 See York Herald, 24th September 1809, for a list of Thomas Tegg’s associated provincial printsellers. Manchester Mercury, 21st January 1800. For examples see, Newcastle Courant, 1st November 1800 and Chester Chronicle, 11th September 1807. T. Clayton, ‘The London Printsellers and the Export of English Graphic Prints’, in A. Kremers & E. Reich eds., Loyal Subversion? 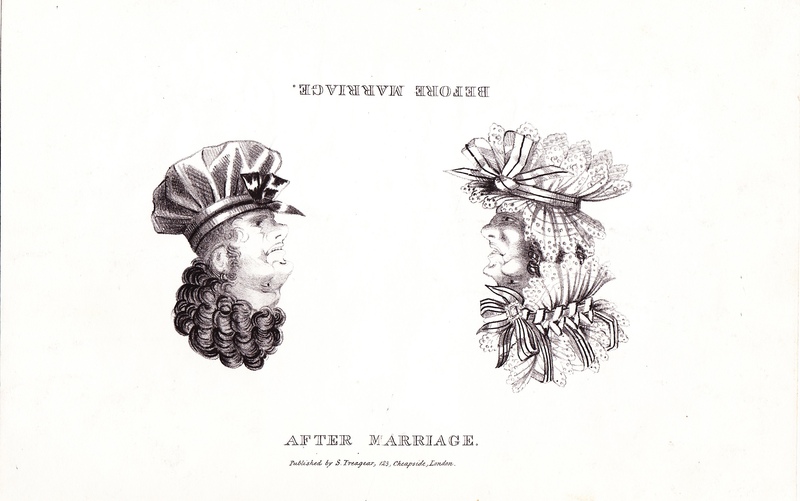 Caricatures from th24th Sre Personal Union between England and Hanover (1714 – 1837), (Hanover, 2014), pp. 140 – 162. Printsellers based in large commercial ports may also have acted as middlemen in the international trade in caricature prints. Samuel Tipper, the London-based publisher of The Satirist or Monthly Meteor, promised to offer “A most liberal allowance… to those gentlemen who purchase the volume for exportation to the East and West Indies, where it must experience a most rapid sale.” Presumably this was either a means of expediting overseas sales by exploiting the expanding maritime links of cities like Liverpool and Glasgow, or merely a clever means of throwing the risk associated with dealing with overseas markets onto other printsellers. Chester Chronicle, 19th February 1808. Leeds Intelligencer, 6th July 1784. Chester Chronicle, 25th July 1800 & Newcastle Courant, 1st November 1800. Chester Chronicle, 19th February 1808. Claims a combined circulation of 16,000 for the first five editions of The Satirist. Derby Mercury, 21st August 1788. 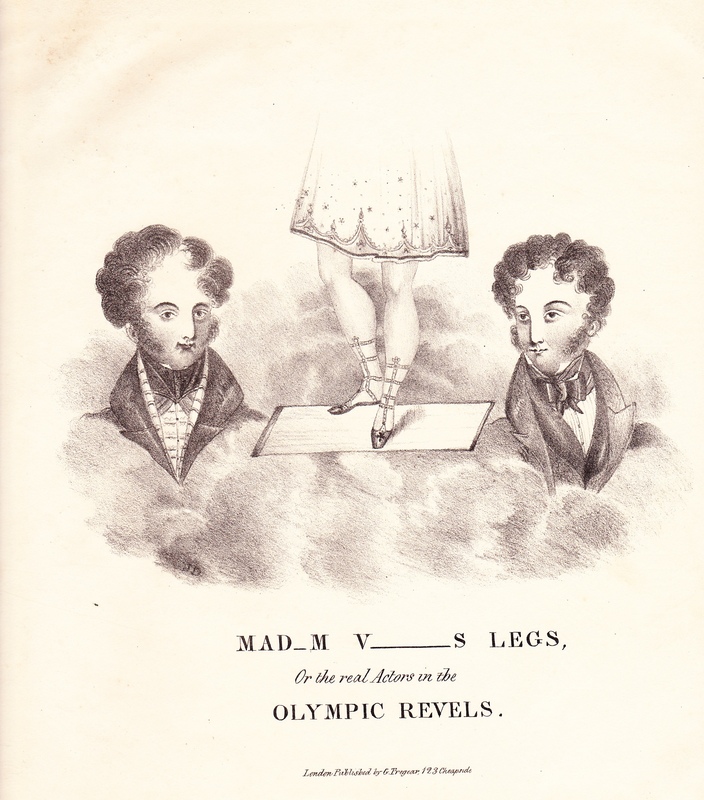 Contains one of the few advertisements in a provincial newspaper to name specific artists and the titles of their designs, there are: Long Minuet at Bath & The Porpogation of a Lie, both by Bunbury; The Prince’s Bow, by F.G. Byron; The School for Scandal, by Rowlandson; and The Cotillion, by Kingsbury. Gillray’s name appears in connection with his non-satirical works, such as his engraving of a scene from the opera Nina and the mawikish portrait of prison reformer John Howard entitled The Triumph of Benevolence, far more frequently than it does with caricatures (see ibid and Northampton Mercury, 7th April 1796). However, descriptions of two unnamed satires which appeared in the Chester Chronicle, 2nd October 1795 and Newcastle Courant, 14th May 1796, are very similar to John Bulls Progress (1793) and The Fashionable Mamma…(1796). 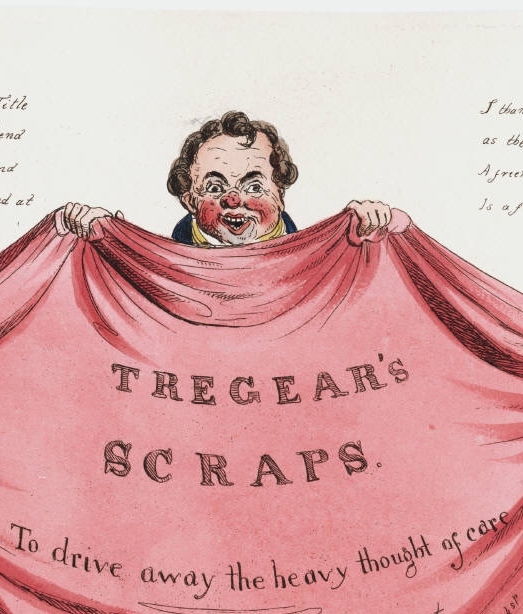 The lack of references to Gillray’s caricatures may also be explained by the fact that Humphrey, who published the bulk of his prints, appears to have disdained newspaper advertisements. I have been able to locate only one advertisement which bears her name in the BNA, it was published in the 27th March 1807 edition of the Morning Post and relates to a caricatured version of Lady Hamilton’s Attitudes copied from Nature. Gillray provided the images for this work but is not mentioned by name in the advertisement. York Herald, 12th September 1809. Chester Chronicle, 12th September 1806 and York Herald, 24th September 1808. The decision to build a commercial following around a particular title, rather than specific artists, presumably reflected both the fickle nature of the relationships between caricaturists and publishers, and a desire to ensure that the balance of power in the commercial relationship did not tip too far in the artist’s direction. Anon. 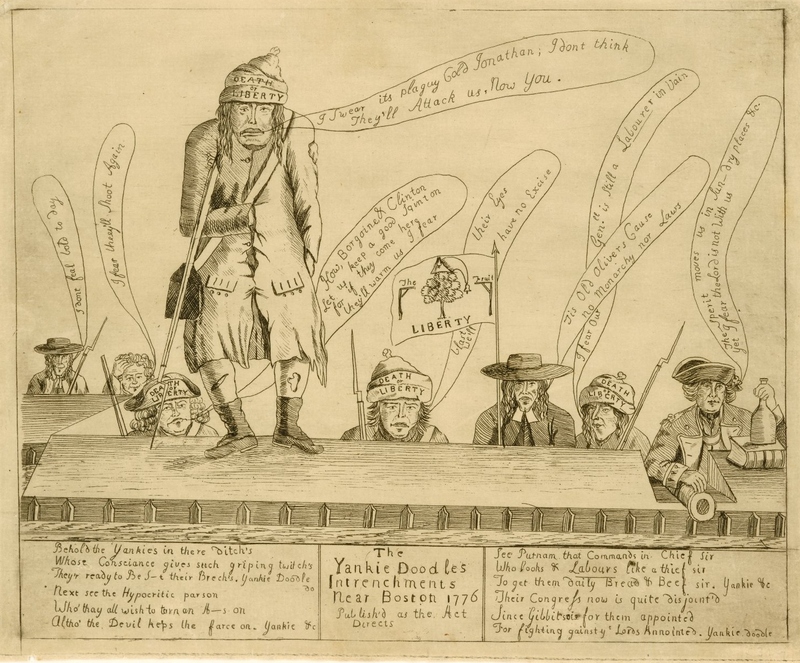 The Yankie Doodles Intrenchments near Boston 1776, published in London c.1776. Vain boasters cease, shall the Yankies the British flag defy? Shall Britons bear the insult, and not to vengeance fly? While Albion’s banner high in air, triumphantly shall wave. While absolution, bulls and bead, lie floating in the main. A shadow independency – A shade great Washington. For Britain is and ever was, high heav’n’s peculiar care. Nor Britain’s glory be transferr’d to them or Washington. This song, which was intended as a satirical retort to a popular rebel marching tune, was published in the Newcastle Courant of 15th November 1777. At that time, the British press was awash with jubilant accounts of Howe’s victories in Pennsylvania, and consequently The Morning Chronicle counselled its readers to ignore the “mischievous impressions” which were already beginning to filter across the Atlantic, via “channels of infamy and falsehood”, of the disaster which was said to be engulfing General John Burgoyne’s army in the Hudson Valley. When the first definitive confirmation of the defeat at Saratoga finally reached Britain in early December, the news exploded like a thunderclap; sending the King into “agonies”, stunning the House of Commons into silence and transforming every coffeehouse in the land into barrack-room of armchair generals, determined to thrash out a plan to defeat the Yankee armies from the safety of their firesides.